I hope that you have had a great week! Our Kindergartners, 1st graders, and 2nd graders worked so hard on their NWEA assessments this week and we saw so much growth in their scores! We are proud of how hard our students work every day to not only grow academically, but also to be positive members of our learning community! Join us at Purple Cow next Tuesday! 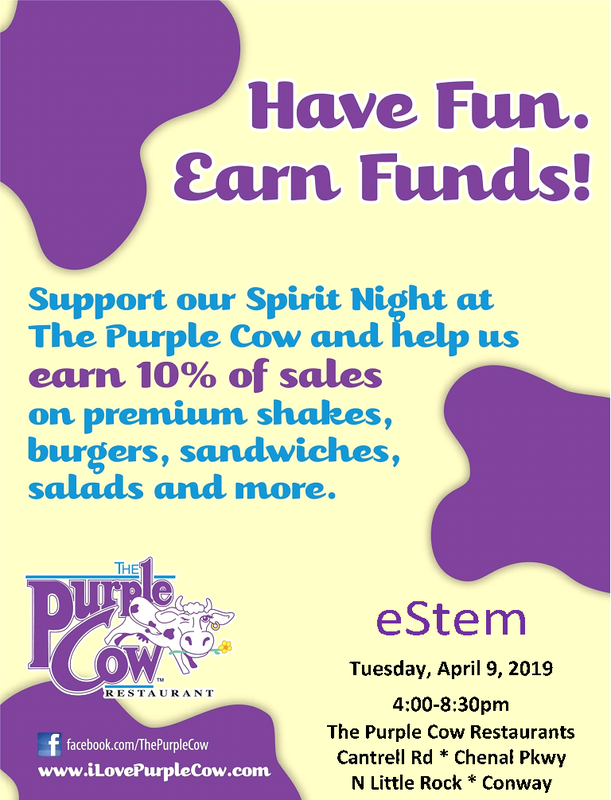 Be sure to eat at the Purple Cow at 8026 Cantrell, Little Rock, 11602 Chenal, Little Rock, or 4201 Warden Rd., North Little Rock from 4:00 pm – 9:00 pm this Tuesday, April 9th and tell them you are from eStem! Part of all sales come back to help our school! 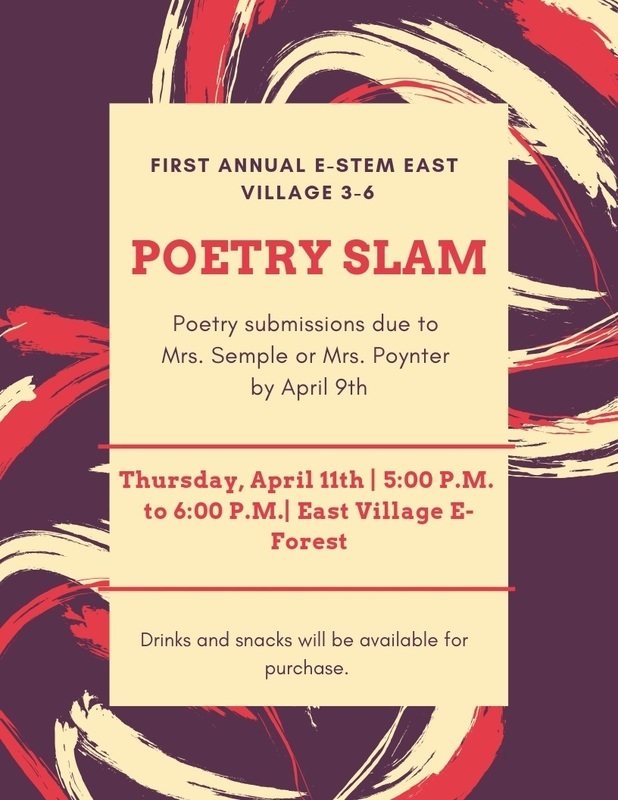 All 3rd through 6th grade students are encouraged to submit entries to Mrs. Poynter or Mrs. Semple. Anyone is invited to attend and hear these students share their poetry. Our students are so creative and we are excited to hear them share their writing! 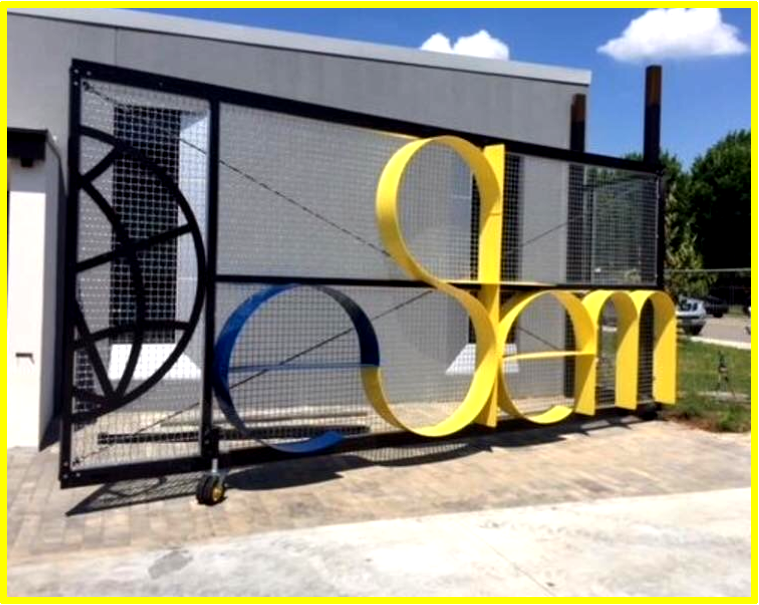 Eco Construction Presents the 9th Annual STEM Soiree. A fundraiser benefiting eStem Public Charter Schools is May 11th! STEM Soiree Raffle to Disney World in Orlando! 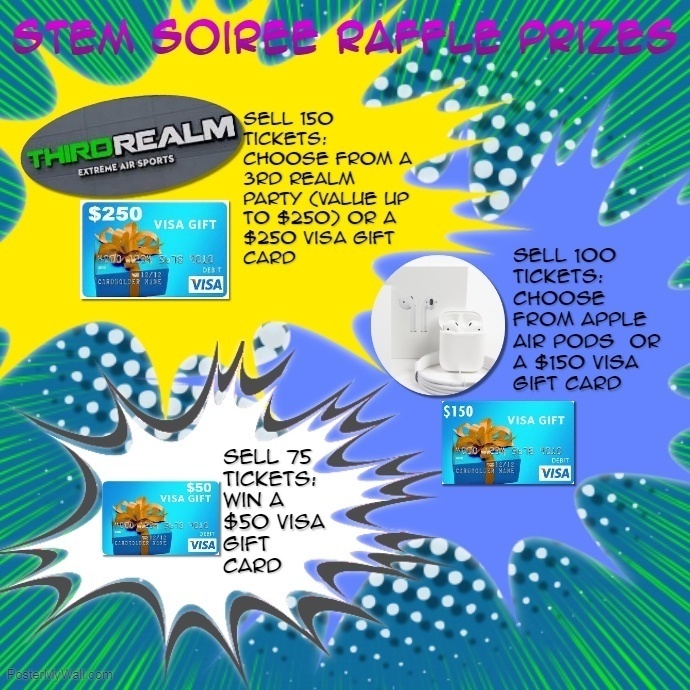 Every student who sells 150 or more tickets can choose between a $250.00 VISA gift card or a 3rd Realm party up to $250.00. The classroom that sells the most tickets in each grade level will receive either a popcorn or popsicle party. Lunch Balances: We have many students with outstanding lunch balances. Please send payment ASAP by way of www.myschoolbucks.com or by cash or check in the office. If you have any questions or need to be updated on your child’s balance, please contact stacy.tullos@estemschools.org. Students should only be getting breakfast or lunch if they have money loaded to their account. Help us to be good neighbors: Please help us remind your children that we all want to be good neighbors. Students should not play in the drains around the Clinton Library parking lot or in the lawn at Heifer. Thanks for your help with this! Lost and Found: Please be sure to label your child’s belongings so we can be sure to return it to them if they are lost! Cash for Casual: We only have 8 days of Cash for Casual left! If you would like to pay for your student for the rest of the school year, send $8 to the office or purchase 8 days at www.myschoolbucks.com! Family Eat Out Night: Be sure to eat at the Purple Cow at 8026 Cantrell, Little Rock, 11602 Chenal, Little Rock, or 4201 Warden Rd., North Little Rock from 4:00 pm – 9:00 pm this Tuesday, April 9th and tell them you are from eStem! Part of all sales come back to help our school! Stem Soiree Raffle: This year we are raffling a trip package to Disney World in Orlando with a value up to $3,000! Raffle tickets are on sale now for $5. You can purchase them from your student, in the office, or at Raffle Ticket. You do not have to know any students to purchase raffle tickets. Students can win prizes for selling a certain amount of tickets. I have attached information on the student prizes! You can also purchase tickets to attend the Soiree on May 11th at Soiree Ticket. Don’t forget to follow along on social media (@eastvillagek6) to learn more about what we are doing each day!